What is common in how God creates what exists? What is different about the creation of man? Man’s rule of creation connects to being created in the image of God. “Have dominion” is an imperative, a directive from God. For Adam and Eve to do this implies God created within them the power to carry out this command, which included everlasting life. For if God built death or failing abilities into creation, their ability to rule over the world would also be lacking. To explain the difference between man and the other animals, Genesis 2 fills in some of the blanks. What existed first in Adam, his material matter or that which made him come to life? “living being”: Hebrew, nephesh [soul] hayah [living]. Genesis 2:19 uses this same phrase to describe animals. So, being a “living being” is not something exclusive to being human. Nephesh is a being’s vitality and life, not denoting a creature made up of two distinct parts: soul and body. Though God created the body first, it is not the human being. Though the soul gave life to the body, neither is it the human being. For man became a living human being when God united body and soul together in the person of Adam. Each person is a body-soul union. None of the Hebrew terms for “soul” (nephesh) or “spirit” (ruach) refer to some nonphysical part of a person. The “soul” or “spirit” refers to the whole person as a living being. Human beings live as souls—we do not have “have” souls. – How did God make Adam a “living being,” which is different from all the other animals? “breathed”: Hebrew, naphash, which means “to breathe” but often used to refer to rest and refreshment. God breathes Adam to life, not speaking him into existence, which makes him different. After our fall into sin, God will need to “breathe” life into us again. We find this in the Old Testament’s usage of naphash as a verb, which occurs three times in the Old Testament. The king [David] and all the people with him arrived at their destination exhausted. And there he refreshed himself. Breath brings and sustains life, at the start but also as that which brings new life and refreshment amid our corrupted state of being. This God does for us on His day of rest for us. We will explore this later. What is different from Adam than the other creatures? “helper fit”: Hebrew, ezer = helper; neged = in front of, opposite to. Ezer is more than a “helper”; it is also a companion to stand with you, even an ally. In the Psalms, ezer speaks of YHWH, who is the helper who comes with mercy (30:10), saves (38:22), delivers (40:13), and is “not far from me” (Psalm 71:12). Neged is something which corresponds to something else. In this usage, it means an opposite, someone who will complete Adam. Without his ezer neged, he will be “alone,” without his counterpart, which will fulfill and complete him. 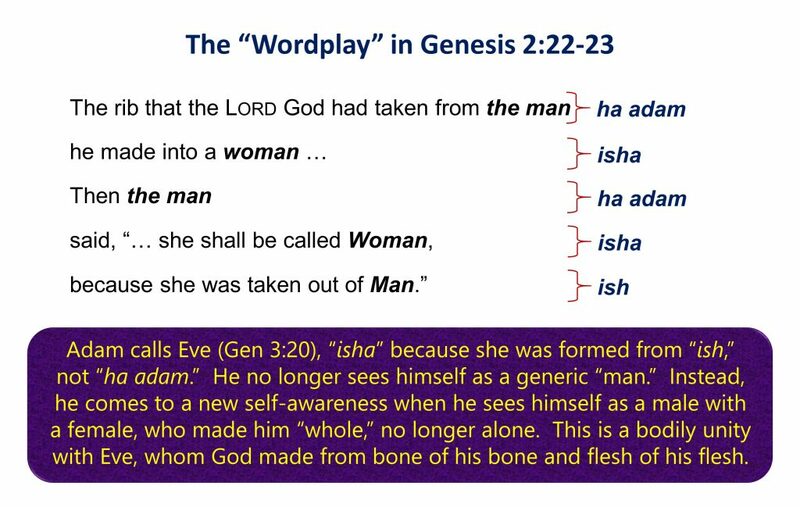 More than ezer neged, the change in Hebrew vocabulary reveals what takes place in Adam after the specifics of Eve’s creation take place. 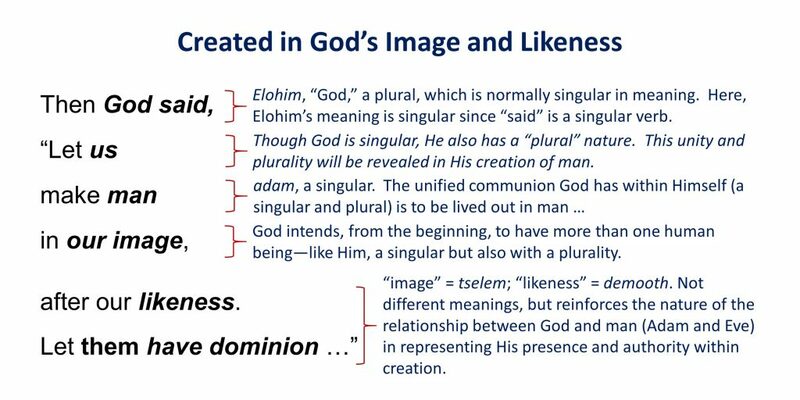 Genesis 1 speaks of man being created in the “image [tselem] and likeness [demooth] of God.” Genesis 2 expands this to include the communion of persons: Adam and Eve. The “image and likeness of God” include not only being human and created that way but comes into its fullness in the communion Adam and Eve share with each other. This communion is something physical, for until Eve was physically present with Adam, he was “alone.” For God formed Eve from Adam’s bone and flesh (Gen 2:23); she was not simply a disembodied “soul.” Without a physical body, made up of material matter, we are not complete and neither is our communion with others. 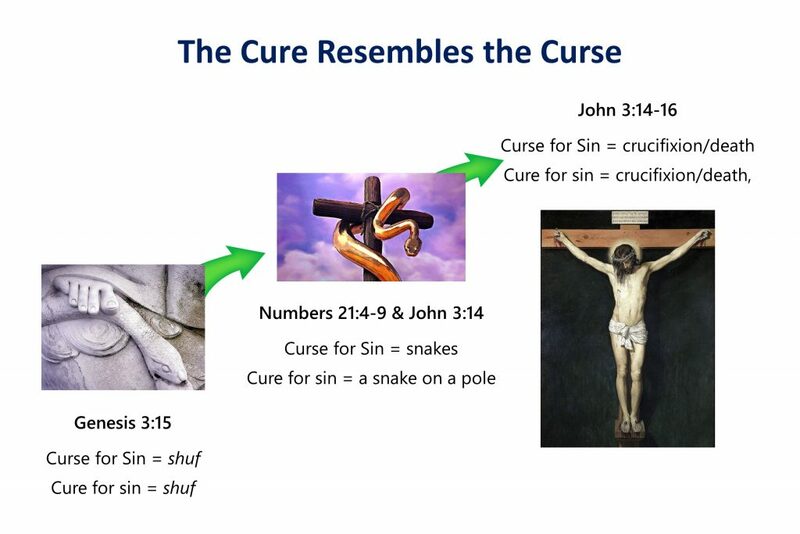 What is the state of being between Adam and Eve when still sinless? “naked and were not ashamed”: The communion between Adam and Eve is total and their intimacy unbarred, revealed by their nakedness and lack of shame. Nothing hid them from each other. Though vulnerable, they are without inferiority, needing no protection from the other. Shame is unknown to them, which is the guilt of the condemned (Psalm 6:10) or of the defeated enemy (Psalm 83:16-17; Micah 3:7, 7:16). They complete each other (ezer neged) without any sense of victor and vanquished, and openness without fear. Humanity falls into sin and death is the result (Genesis 3). What else suffered from the fall into sin? How are the effects of this fall manifested? The ground is cursed, and from it, thorns and thistles will grow (Genesis 3:17-18). Creation no longer reflects God’s original ordering. So also is our ability to “have dominion” over this world compromised. Though Eve participated in our sinful downfall, Adam receives the “blame” because only he received God’s breath (Romans 5:12-14). “Sin entered the world through one man, and death through sin, in this way death spread to all people, because all sinned” (Romans 5:12). As the Fall into sin was a physical act, so is our salvation. What was the “Word” involved with and what was in this “Word”? What three verbs describe becoming children of God? What reveals that we cannot self-generate becoming children of God? “dwelt among us”: more literally, “tabernacled among us.” John tells us Jesus is the fulfillment of the Tabernacle. In the Old Covenant, the Ark of the Covenant was where God became present for his people in the Tabernacle, later the Temple. As God “refreshed” His people on the Sabbath for their salvation, God now enfleshes Himself in the person of Jesus to save us in the New. But the gift is not like the trespass. For if by the one man’s trespass the many died, how much more have the grace of God and the gift which comes through the grace of the one man Jesus Christ overflowed to the many. Discuss: Why did Jesus need to become incarnate to save us? Discuss: Why are physical means necessary to save us? Jesus’ incarnation is the ultimate affirmation of physical creation and our bodily existence. For divinity, Jesus, God’s only Son, entered into His creation and became part of it. “For the entire fullness of God’s nature dwells bodily in Christ” (Colossians 2:9). The redemption of Christ, His death on the cross for us, was not purely “spiritual.” It was as physical, where blood was sacrificed to restore us with His Father. In him [Jesus], we have redemption through his blood, the forgiveness of our trespasses, according to the riches of his grace. Jesus entered the Holies of Holies once for all time, not by the blood of goats and calves, but by his own blood, having obtained eternal redemption. If we walk in the light as he [God the Father] himself is in the light, we have fellowship with one another, and the blood of Jesus his Son cleanses us from all sin. You [Jesus] are worthy to take the scroll and to open its seals, because you were slaughtered, and you purchased people for God by your blood from every tribe and language and people and nation. Your body is not a “shell,” any more than Jesus’ body is a “shell.” No, it’s an integral part of who you are, part of your identity as being human. Next week, we will explore further the impact of Jesus becoming human to save us means. Link to the next Lesson.